Bionic Briana: Zoodles w/ Fresh Basil & Artichoke Heart Chunky Sauce. Zoodles w/ Fresh Basil & Artichoke Heart Chunky Sauce. 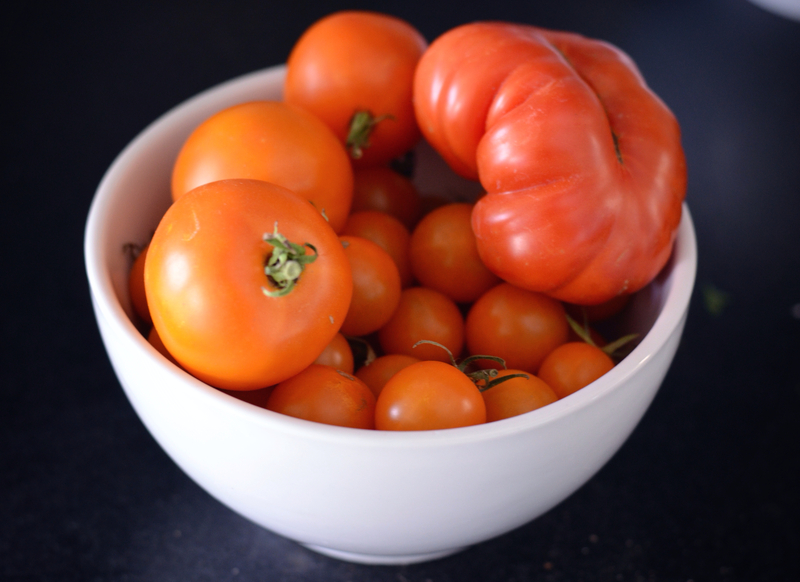 I wish tomato season would last forever. What inevitably happens whenever we take Alice out of her usual sleeping arrangement to go on vacation, she reverts to needing one of us to fall asleep with her for naps or bedtime. In her defense, though, we are to blame for her needing this extra help. Most toddlers aren't good with change and ours is no exception so when we put her to bed while at the hotel or when at my in-laws, we took the easy way out and laid down with her when she asked (okay, whined). And now we're paying the consequences. Sleep for all of us has been tumultuous since we got home on Saturday with many night wakings and cries for mama to lay down with her. So we're taking it slow, talking to Alice about where Mama and Daddy sleep and where Alice sleeps and encouraging her to go to sleep by herself without either of us lying down. There's a lesson here. If you have a solid one, don't mess with your kids' bedtime routine. On a different topic, now that we're home and I'm back in my own kitchen, I've been super motivated to make things using all of the fresh stuff we're getting through our CSA and the downtown SLC farmers market. 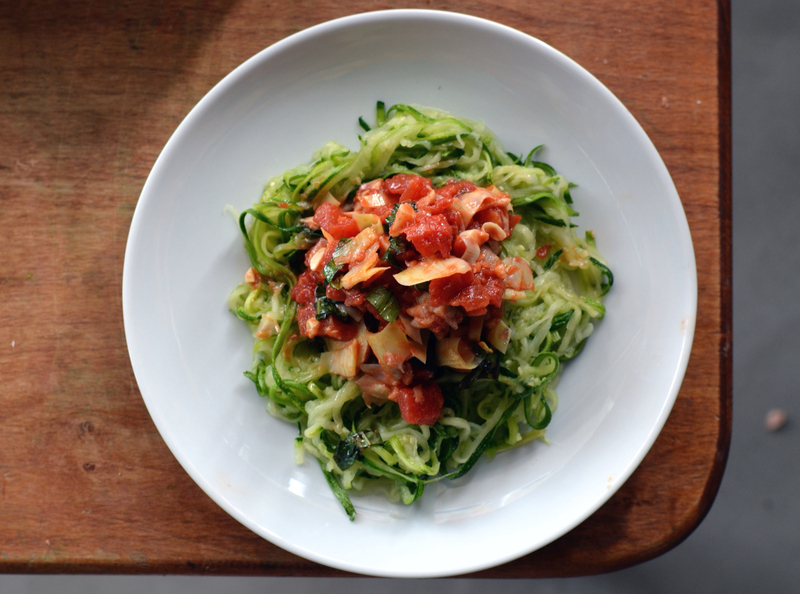 So last night I made zoodles with fresh basil and artichoke heart marinara. It was so fresh and so easy and so delicious. Here's the recipe. After making your zoodles, put them in a strainer and put 1 tsp of fine salt per zucchini, toss to coat and place strainer over the sink or in a bowl for 20 min. Then rinse thoroughly with cold water and drain (I got this tip from Stupid Easy Paleo and it helps to draw the water out, resulting in a slightly less soggy zoodle). While the zoodles are draining, heat olive oil in a sautée pan over medium heat. Add the onions and garlic and cook, stirring occasionally, for 5-7 minutes (be careful not to burn the garlic!). Add the tomatoes (in a pinch, use a can of diced!) and turn the heat to a simmer, stirring and mashing the tomatoes occasionally. After an additional 8-10 minutes, the tomatoes should look broken down and saucy. Add the artichoke hearts and continue to simmer for 2-3 minutes. Right before serving and with the heat off, stir in the fresh basil (I didn't add any salt to this sauce because of the saltiness of the artichoke hearts. Trust me, you won't need it!). In a separate pan, heat a splash of olive oil on high and then add your drained zoodles. Using tongs, toss and stir for just a minute or two! Your goal here isn't to cook but to just heat them through. Plate the zoodles and top with the sauce. And enjoy all of those fresh flavors of summer. 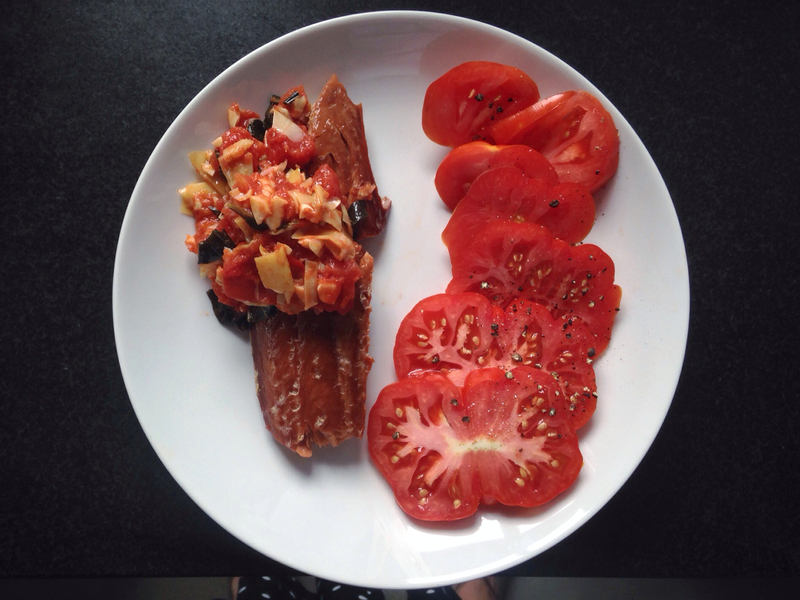 Smoked salmon with leftover chunky sauce & a side of EVEN MORE tomatoes.